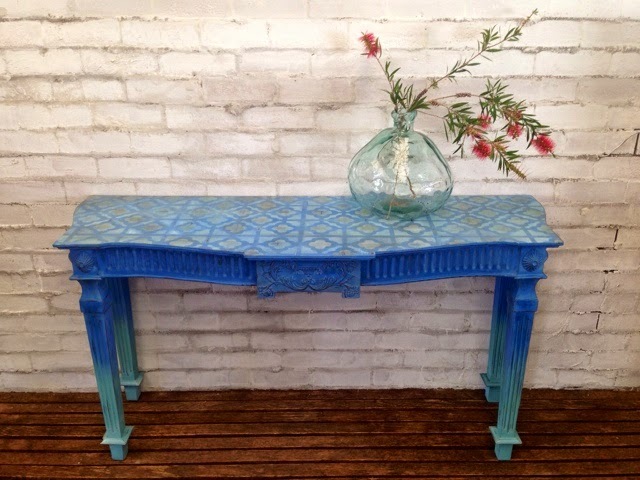 My first 2 Painter in Residence projects have been released via Annie Sloan's blog! I have had a great response to both pieces. 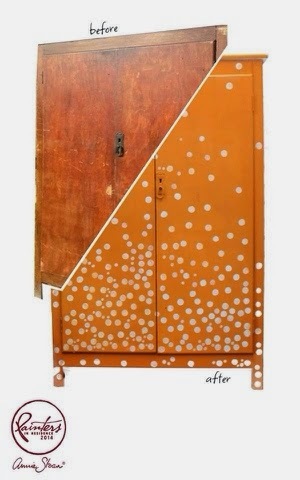 Here are the before & after shots - as we all love those! So this console was dated and too shiny for my liking! 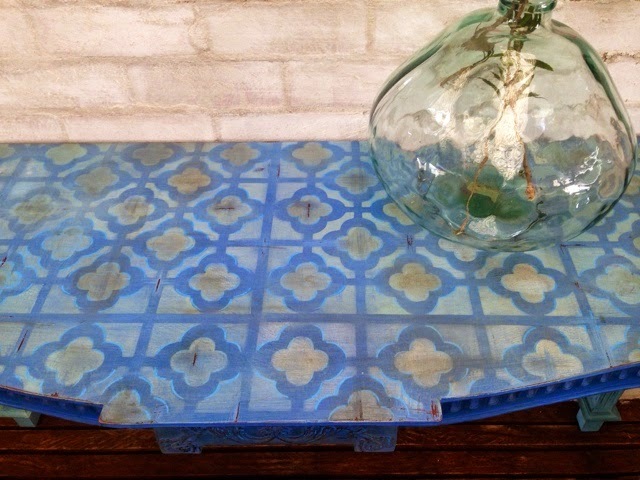 I used Provence, Greek Blue & Pure White to create the ombré effect and those shades again on top for the Moroccan tile-effect pattern. 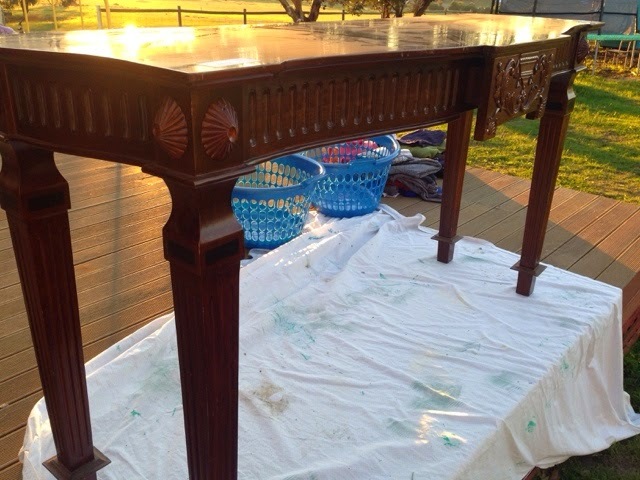 The piece was waxed for protection, an aged effect and a beautiful subtle finish. 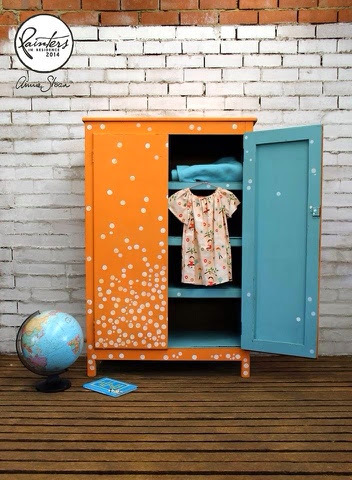 For my children's wardrobe, I mixed a cute soft peach using Barcelona Orange & Pure White, then created a random spotty pattern using mainly a cork and pencil tip to print (then neatening up with a fine brush) in Pure White. 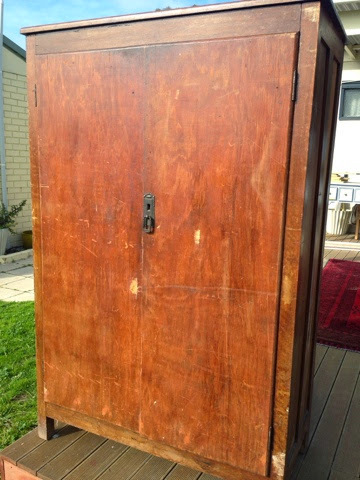 The inside is painted in Provence which is a stunning contrast to the orange tones. Thanks to everyone who has been so kind with the reveals, its full-on painting with so many people ready to comment and judge your style - its all been really lovely though! Adorable.You have an intriguing eye for color combos. LIKE. Now that's creative. Both pieces are so original. I love that you are willing to take risks with your choice of colors. Please keep them coming. مع شركة نقل اثاث بالخبر سوف تحصل على درجة عالية من الأمانة فمعنا لن يوجد إهدار أو ضياع للمفروشات حيث أن الشركة تعمل على حفظ الأثاث بدرجة عالية من الجودة . عزيزي العميل لو تعرضت إلى احد المشاكل الطارئة بالنسبة لمكان السكن ولا تجد المكان المناسب حتى تقوم بتخزين الأثاث إلى حين البحث عن مكان أخر فان شركة نقل اثاث بالخبر توفر تلك الميزة حيث يوجد لدينا مخازن كبيرة تم إعدادها وفقا لعدد كم المعايير والمقاييس التي لا تضر بالأثاث وتم عزل تلك المخازن تمام سواء من الأرضيات وأيضا الأسطح لعدم إلحاق الأذى بالعفش سواء من الرطوبة أو من التسربات الحرارية ويقوم فريق من العاملين لديها بإعادة تركيب القطع مثل الغرف بكل أنواعها حتى لا تتعرض إلى الثني ويمكن تركيبها بسهولة بعد ذلك. - يجب أن يتم جمع الأغراض الشخصية قبل الانتقال بأيام حتى لا يتم نسيان أي غرض . - يجب أن يتم وضع كل المقتنيات الصغيرة في كراتين وكتابة محتواها من الخارج حتى تسهل كثيرا في عملية الانتقال ورص المقتنيات . - يجب أن يتم تنظيف الأجهزة الكهربائية وفصلها عن الكهرباء قبل الانتقال بمدة 48 ساعة للحفاظ على الفريون . - لو كانت الشقة أو المنزل تمليك يجب أن يتم إغلاق النوافذ جيدا للحماية من الأتربة ولو تم ترك بعض قطع الأثاث يجب تغليفها وتغطيتها جيدا . All of these are really amazing and beautiful...I love to make these furniture designs which are too good for all of us...! New header & last weeks pieces!